Be an elearning action hero! Quick! Design some elearning that has compelling activities and a real business impact! I’ve been using a quick, visual process to design projects. I call it action mapping because it helps you change what people do, not just what they know. It helps you design action-packed materials that are 100% dedicated to improving business performance, and it can keep stakeholders from adding extraneous information. Here’s a slideshow with an overview. It uses lighthearted stock photos from 2008 of a guy dressed in a ninja outfit. No political statement is intended. How does it work in the real world? The map is a content repository because I use Compendium, which lets you include PowerPoint slides, Word documents, and other files in the map. This means each information node actually contains the relevant source materials. If you use a rapid tool, you could probably just dive into the tool after creating the map, using the map as an outline and tightening the source materials as you go. 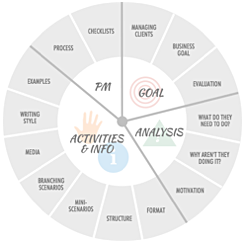 A tool like the action map makes everyone focus on the business reason for the project and keeps extraneous information out–it provides discipline. Undisciplined communication is the third biggest source of harmful complexity in business, according to Bill Jensen in Simplicity: The New Competitive Advantage. Time pressure allows people to justify behaviors they would not accept from others….Communication becomes a matter of disseminating information and taking any available e-shortcuts. When it comes to communication, business is facing major discipline and accountability problems. How does this work at your organization? Do you have a design process that keeps everyone focused on the business goal for each elearning project? Or are you expected to include whatever information the stakeholders say you should include, and if so, how might you change this? I realize most people will assume that I’m talking about designing an online course. However, the process applies to any instructional design, and I’d really prefer for people to consider other ways to “deliver” learning. My favorite async way is to combine HTML pages with Flash, using the Flash only when it’s really necessary and making the whole thing searchable and available on demand, rather than locking it away in an LMS. One of the cool (to me) aspects of action mapping is that it encourages us to consider non-linear ways of covering all our bases–it helps us break out of the linear course. Also, the practice activities could take place offline, in a workshop, in an online collaborative space, or in whatever other format you need. 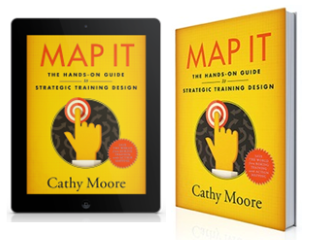 The mapping process is just a design process and not a prescription for what you should include in an online course. Wonderful. In special education this is EXACTLY how we custom design learning interventions and programs for students. We even use graphic note taking to increase focus on visible actions that need to happen as a result of services. I have noticed a very strong connection between innovative tools like yours and the practices that have evolved in special education. The nature and severity of the needs in that field have created an ecosystem where nothing that isn’t learner driven and objectively observable can survive. Perhaps with tools like yours we can get the same level of commitment to results in other types of learning experiences. I already use mindmaps to structure my current courses (I am just a rookie at being a course developer – six months on the way now) which is already really useful, especially for making crossovers and connections between all the material – but using actions as the nodes and not ‘chapters’ is even better! Also from the client’s point of view, much more tangible I would say. I will definitely be using this framework. Already I see something dawning for one of the process trainings I’m working on – cut the excess, bring it back to the actions. Cathy… this is great! It seems like a great way to encourage SMEs to move away from the “yes! this information is extremely important to the learner” method of content selection. I’m going to try this on my next project and encourage the rest of the design team to try this model as well. You know, you’re stepping on dangerous ground when you advocate getting rid of the trivia games. I hope your ninja action heroes are prepared for those sent by the organization Fascists Aligned in Learning. Cathy, Great post as always! Timely information as I have just started using a mindmap software for planning. Keep it coming! YES!!! I’ve been a proponent of ‘start with what they DO’ for years and I truly believe that it makes a design so much cleaner, easier, effective, engaging, and targeted than information dump (structured copy / paste). The best courses I’ve seen have focused at least 90% of their effort on supporting what the learner must do. The worst courses I’ve seen seem to have focused 90% of their effort on what the learner must know. To expand on this action map concept – I’ve recently blended a similar map with ‘what they need to know’ type activities in a way that I think respects the learner’s intelligence and preferences. I corralled the performance areas to create hubs for activity. These hubs connect activities that could stand on their own (active tutorials, etc..) supported by the appropriate references and reading assignments. The core hub exposes all of the activities and references in an index, enabling the learner to access any component at any time. Around the outside of the map is the guide sequence. The guide sequence provides the activity sequencing, lining up the activities with supporting ‘knowledge gathering’ activities, real-world activities, and checkpoints. The knowledge gathering activities may be reading assignments. We tend to make learners read a lot anyway in many of our courses, if gobs of information transfer is the goal a screen > screen > screen dump is a really unnatural way to do this (even if it’s not in screen text, but in narration). We build reading assignments as short articles that read and have a similar layout to a magazine article. I’m attempting to provide opportunity for the learner to pick what they want / need, while still providing the right level of guidance through the instructional components (the glue). MindManager, FreeMind, and CMAP are all good tools to support quick mapping of concepts and focus assemblies. Awesome post, Steve! I especially like your point of having knowledge gathering assignments that they can choose to access to help them complete an action or activity. I dunno… no icebreakers? No terminology word-searches? No set of nine dots that I have to connect without lifting my pen? No Jeopardy-style review questions? No learning styles? No MBTI types? How can this be learning? I did NOT think you were talking about online courses per se, but I think you’re right to stress that it ain’t necessarily a linear course, regardless of delivery vehicle. When given poorly-formed problems (“our supervisors need better communication skills”), Joe Harless used to ask (as diplomatically as possible) “communication skills for what?” (though his Georgia accent made that “fur whut?”) That was his equivalent of the first two cycles of your map — focusing on what people needed to do, and figuring out how to help them become able to do it. Jago, I agree that mind-mapping can help you make new connections in material. I enjoy chopping up the existing material and moving it to the map to show that the content doesn’t have to be presented the way they’ve “always” done it. Kerry, I hope action mapping helps your SMEs see the light. It requires a big change in mindset, especially since most of us were taught in school that learning is simply information transfer. Tom, the ninjas are preparing for battle as I type this. 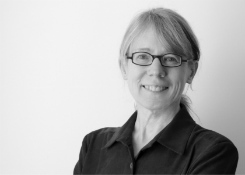 Karyn, I agree that a lot of clients feel most secure when their material is an information dump. It’s what we’re all used to, and when you have accumulated a huge pile of information, you can point to it and say, “Look, we covered everything!” If you manage to convince your client to change their approach, please let us know how you did it! David, I’m glad the post was timely. I’m hoping to do a future post showing how I use Compendium, which is a great tool in many ways. Steve, thanks for your ideas. I love the idea of performance hubs with stand-alone activities supported by references. It sounds like the project can work as both a structured course and a just-in-time reference, which I think should be our goal more often. I also like the idea of breaking out reading assignments into magazine-like layouts rather than spoon-feeding paragraphs to learners one small screen at a time. One challenge I’ve had is that mind-mapping software tends to assume that I want to map hierarchical information, with each node spawning smaller child nodes. In action mapping, sometimes I want two nodes to share the same child (for example, two real-world actions could be covered by one practice activity). So far, only Compendium has done that for me, but I haven’t had time to check out FreeMind. Does FreeMind let children have multiple parents? Dave, lol – I love those questions. Cathy…I saw your concept diagram via Cammy Bean’s presentation at DevLearn this year. Any chance you could update the link to get to a PDF of your diagram? If that link isn’t working for you, please let me know. Steve, thanks for those diagrams. I can see how relationships in MindManager could match up multiple parents with single children, as well as make other links. And the concept diagram is decidedly cool. I especially like the guidance ring around the map, the way you show build-up activities, and the fact that learners do activities in the real world. It looks like everything the learner needs is concentrated right there in the map, rather than spread out through multiple screens and nested menus. And a circular path that I can see in its entirety seems more inviting than a list of steps that scrolls off the bottom of the screen. Wow! These ideas are not just for business and elearning. I cannot wait to reiterate these thoughts with my colleagues. I teach high school and am currently training teachers in technology integration and teaching the 21st century learner. These concepts, particularly the “dump the drone” idea, are so applicable to schools and teaching. I love the mapping idea. Although we are familiar with graphic organizing in the k-12 learning environment, I think we as teachers see that as a “student” skill and not a planning skill for great design in lesson planning. I want to use this approach with my English department to see if we cannot come up with a more focused goal and set of activities that involve less talk and more focus. Thanks! Our instructional designers’ major roadblock to make learner centric designs is the content focus of the subject matter experts. These 31 pages demonstrate in less than 10 minutes why and how learning can be structured differently. Mike and Brandi, thanks for your comments. I agree that one of the biggest problems in any instructional field is to get the subject matter experts to view content delivery as a means to an end as opposed to the end in itself. We’re not just delivering content, we’re using content to build expertise. I’m trying to find more ways to communicate this to SMEs, so if you have any approaches that have worked, please share them here! Company won’t allow me to download Compendium? Any comparable products out there that would be recommended? Is it just compendium or is there a lockdown? If you have a machine lockdown, you might have some success with Web based mapping tools. Try one or more of these, something might strike your fancy:) In some cases, I prefer the Web based tools – they allow me access to my stuff pretty much anywhere I am. Great for school, etc.. There are more than the reviewed tools on this site, but this will provide a comparison. I’ve tried out all of these except Thinkature. Both are OK tools. I fell back to MindManager because it’s more responsive and more closely meets my needs. Steve, thanks for those great links. I’m an increasingly enthusiastic fan of platform-agnostic online tools. Mark, I’ve also started using MindManager. It works for the action mapping approach, though it’s not as free-form as Compendium. Thank you both. Someone suggested Visio, but I don’t believe the same capabilities exist – probably closer to MindManager. I will look into each of your suggestions. Great post – love learnin’! Yes! Action mapping is the most wonderful thing. I have worked quite some time with it but under different names; effect mapping and impact mapping. Keep up the good work, Cathy! And I agree, common roadblocks for effective training design is the topic-centered SMEs and the media-centered Marketing departments. Action mapping helps to win their hearts and minds. If there is a gentle way of convincing the SMEs/Clients that this would be the better alternative, I’d be glad to find out what it is. Zelanne, thanks for your comment. I’m not sure there’s one effective way of convincing SMEs and clients to move away from the information-heavy approach. Unfortunately, it’s common to believe that exposing people to information is “teaching” them, and the more information, the better. I wonder if the economic downturn will help convince people that we should do a better job of justifying the expense of elearning and other training. If we can show how our materials directly tie into and support the organization’s objectives, we’ll be more likely to keep our heads above water. Excellent slide show, and good plan. I already did some of this, but I never outlined what I did. Now, I don’t have to, because you’ve done it for me. 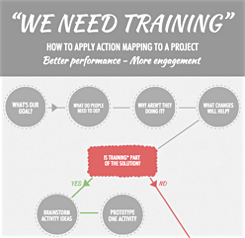 I truly believe that Action Mapping is the way to go in this generation of training courses. Thanks for sharing this and please have a look at my take on your article http://road-to-learning.blogspot.com/2009/03/action-mapping-in-action.html.